Since I have been limited in my training time, I’ve been challenged to be more creative with my bike rides. Sometimes the point is not so much to reap huge gains in fitness or top-end speed, but to keep from going too far backwards, too fast. With that concept in mind, I have invented the No-Net-Increase-Ride. The concept is simple. Establish a desirable food objective, determine the amount of calories, calculate the time required to ride a bike to burn those calories, and ride the bike to the food objective. Let me illustrate with an example. Suppose I would like to spend a little time visiting with one of my long-time cycling buddies. Let's say we agree to meet up for a piece of pecan pie and coffee. Well, the pie and coffee would provide a little more than 500 calories. The calorie burn rate for cycling that I found online said that I could burn about 500 calories per hour, if I ride (without drafting effects) at a speed of 15 mph for an hour (the 500 calorie/hour rates seems a little high, so I might need to verify this). So to fullfill the purpose of the ride, my buddy and I can agree to ride for approximately 30 minutes and end up at the restaurant, eat pie, drink coffee, and chat. Following that we cruise casually at a 15 mph pace back home. We have a nice ride, delicious pie, and catch-up on life. All with no net increase on the waist line. It's not really going to help us win the next race, but it seems like a pretty good way to enjoy the social aspects of cycling. Yesterday's thoughts are subject to misinterpretation. Let me clarify. First, there is a small group in my own church that is very interested in pursuing diligent application of new testament principles. Second, there are those in my set of friends and family that have taken the time to explore spiritual growth with me in a deeper way. In fact, some have joined with me to pursue changing the way we live so that we might, "have it more abundantly" (John 10:10). ...thank you. You are a great encouragement. Jesus said, "A prophet is not without honor except in his own country, among his own relatives, and in his own house" (Mark 6:4). Although what follows will be an application to my own circumstances, I am not claiming to be a prophet in the sense Jesus used the word above. As I understand it, "prophet" refers to one who "speaks for God". This is often used to refer to those who are directly inspired to speak word-for-word His message (such as Isaiah, Jeremiah, John the Baptist, etc.) That said, christians are called to tell others about the good news (Matt. 28:18). Acts 8:4 indicates the early christians did this, "Therefore those who were scattered went everywhere preaching the word". So in a sense, christians are also, in their own way, to speak for God. Being eager to talk about some of the lessons learned in the last 2-3 years, I've brought up some of these in numerous conversations with friends and relatives. These friends and relatives have included those with whom I attend worship. Many are not interested in talking about spiritual topics and would rather discuss worldly things. Some seem to actually take positions that surprise me in light of the history I believed them to have with Bible concepts. However, the response of those outside my normal circle of believers is what surprised me most. There are people that are hungering for spiritual growth and seeking diligently for ways to actually apply Biblical principles. A short conversation with a co-worker resulted in an invitation for me to "tell my story". Imagine this. Several men from another church are planning to assemble together on a weekday evening (not a church service) to talk about ways to be more spiritually minded. I told my co-worker about some fairly radical applications of Bible principles and he was not turned-off. Instead, he immediately invited his friends to hear my story, because he knew enough of their circumstances that he believed this message would encourage them to serve God and their families in a better way. So it is interesting to see who is hungering for spiritual food. It is interesting to see who will make the time to seek it...and who will not. It is interesting to see who is satisfied with religious traditions and who is not interested enough to continously re-evaluate traditional views. It is interesting to see who doesn't mind laying their hearts open before God to be examined and who, by their defensiveness, appear to lack trust in God and His word. It is interesting to see who has enough faith to think that truth can come from numerous sources and not only from full-time evangelists. So a small group of us will assemble soon. Our prayer is that we will honor God in this assembly. If you are reading this and are feeling uncomfortable, I suggest you pray that God will use this time for good...and have faith that He will do so. My darling wife is a dachshund fan. I don't know anything about dogs and nothing about dachshunds. I do know something about bicycles and can spot different brands and different styles of bikes as they spin by. My wife is consistently amazed by my ability to overtake a cyclist, and identify the bike, while driving in the car. I might say something like, "Wow, did you see that nice lugged-steel Trek with the Berthoud handlebar bag and downtube shifters?" To which she'd say, "How can you tell? I didn't even notice the color". Of course the situation is reversed when we are in different surroundings. Say for example our local animal shelter...or maybe the dog park in Denton. Her ability to recognize a dog at great distance and tell me its breed, typical personality, and whether its is well cared-for or not. She knows dogs and has a special place in her heart for them. Due to her sympathetic heart and involvement with a dachshund rescue group, we've been "collecting" dachshunds for several years now. They come to us in a temporary "foster home" arrangement...and then they decide they like it here and never leave. Now that I've established our respective areas of knowledge, here's my point. 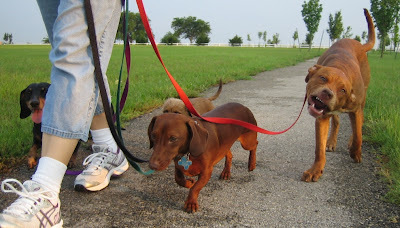 Recently, we've had this new dachshund added to our group of three and...I don't know...something just isn't right. She tells me he's a dachshund, but there is something different about him. I can't quite put my finger on it, but he's a little peculiar. 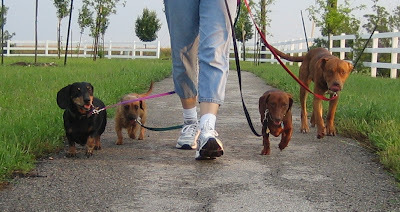 Here we have Joey (the black and tan), Ted (the miniture wire hair), Bill (the red), and the new boy Gus. See anything different about him? I understand that my wife is the expert in these matters. What can I do but defer to her knowledge and insight...? ...but I can't help wondering about ol' Gus here. 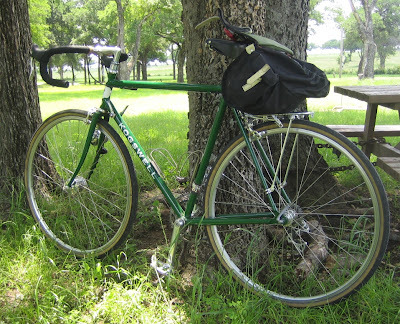 Today's ride was along a portion of the Denton Greenbelt Trail. 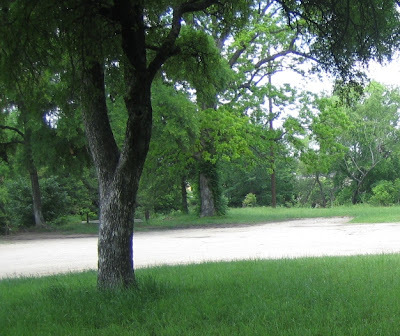 It starts just east of town and heads north along Elm Fork up to Ray Roberts Lake. Due to time constraints, this ride covered only 6 miles up and 6 miles back. 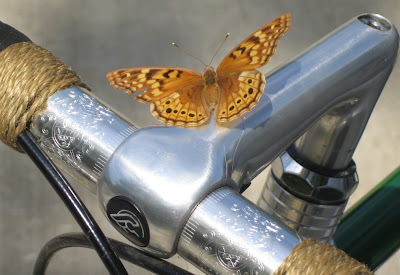 It was a ride through the peak (surely) of butterfly season. 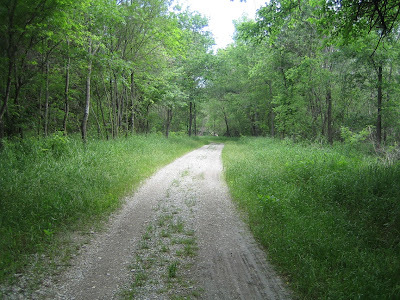 It is a pleasant trail, but not as well-constructed or well-maintained as the Weatherford-to-Mineral Wells converted railroad trail. It follows a waterway and is, therefore, low in elevation. After several recent rainy days, there were numerous muddy and soggy areas. 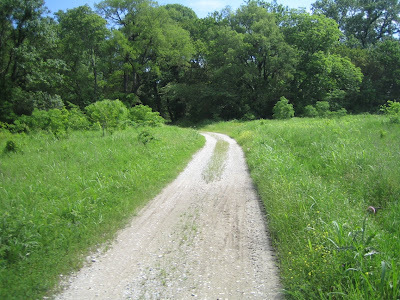 Generally, the trail consisted of a one lane-wide gravel path or dirt/gravel mix double track. The trail meandered in and out of well-shaded forest areas. 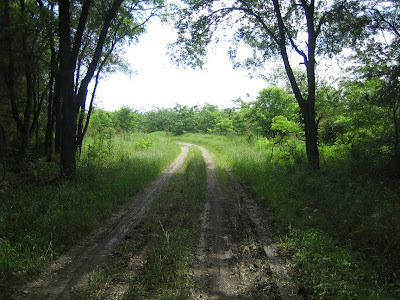 There were no long or steep grades, but a few bumpy areas that were close to the limit of my road bike with 35mm tires. Even so, I had no difficulty with the bike and found the trip quite enjoyable. If I don't have my 650b-wheeled, fatter tire bike built up before my next desired excursion to the trail, I won't let my current bike stop me from returning. Hopefully, next time more time will allow more exploration. Today provided an opportunity for a picnic lunch. 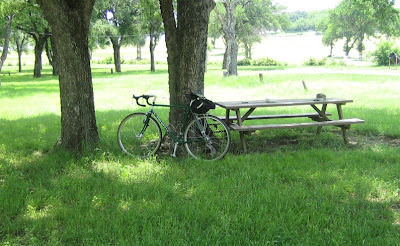 The weather was fine and there was sufficient time to pack a few items in the saddlebag for a short spin down to a nearby park. After working inside at a desk all morning, it is just the thing to refresh the mind for the afternoon. Bishop Park not a vacation spot. But it is only 1 mile away, has adequate shade, and is ideal for a sub-one hour-get-away. So after a 5-minute spin downhill to the creek, a few quiet moments of refueling and meditation were afforded. The return home was more of challenge, climbing the gentle 80 feet back home, but point of the trip was to take a ride. Therefore, the slower the pace, the longer the ride. The trip was over too soon despite my poking-along-pace, but it was time to get back to work. Even the short rides are great. 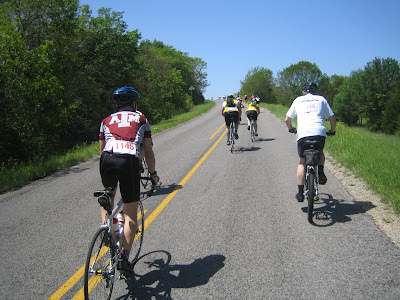 As promised, and without much additional explanation, here are a few photos from the April 28 ride in Muenster, Texas. 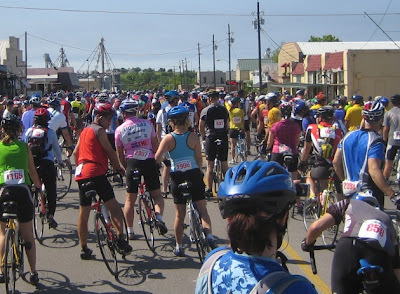 The start included almost 2000 riders. They were all lined up on a city street eager to start pedaling. If you can spot the red light down the street, you can get an idea of how far back we started. The first part of the course was downhill and with a slight tailwind. The going was nice and easy. As you can see, one of us was going slow enough to keep the pair of us from being in the front. I'll not mention any names, but the slow dude was on the green bike. It didn't take long to find the hills. This photo was rushed immediately after the start of the climb. Experience whispered that I'd need both hands on the bars and some mental focus to get over the top of this one. Notice my pal in the Aggie jersey in the photo above. Notice he is NOT the dude riding a green bike. However, lest my pal decide to ever poke fun at my lack of speed, I'll gently remind him of the photo I did not post. There's really no reason why anyone else needs to see that one. But I'm saving it just the same. Well...because the camera and the computer are in two different cities, this is simply a brief update. For now, it will suffice to say there was a bicycle rally as a part of the Germanfest activities in Muenster, Texas on April 28 and there are photos to prove it. A few photos will be posted when the camera is available again. In the meantime, many thanks go to my good friend from Sulphur Springs who seems to have a healthy love of cycling. It is nice to be able to talk the language with someone who understands from time to time. After the ride, a feeling of gratefulness was the primary sensation. Yes, the legs were a little tired. Yes, muscles needed a little protein. Yes, the skin caught a few too many rays. And, yes, the endorphines were pumping through the bloodstream. 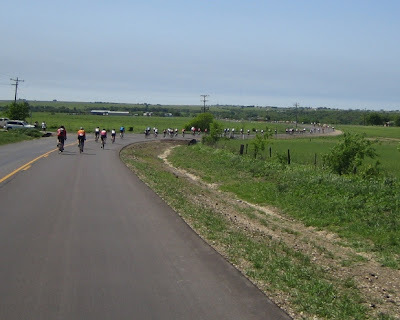 The biggest sensation, however, was being thankful for the opportunity to share the experience of riding a bike on a picture perfect day with a dear friend.